In celebration of topping the 2017 Harris Poll for Best Corporate Reputation, Amazon is taking $8.62 off orders of $50 or more today only when promo code BIGTHANKS is applied during checkout. Hey, any savings is good, right? The best way that we’ve found to cash in on this promotion is gift cards. While this code doesn’t work for Amazon credits, it does seem to be compatible with just about every other store and restaurant sold on the site. That means you can get a $50 gift card from Starbucks, Whole Foods, Staples, Buffalo Wild Wings, Banana Republic and many more for $41.37 when the aforementioned code is applied. These are physical gift cards, so they’ll arrive in your mailbox within a few days. Even if you don’t need the credit for yourself, loading up that desk drawer for birthdays or last-minute gifts is never a bad idea. Shop the entire selection for more. Treat this Card like cash. Reload your Card, check your balance and find out how to register and protect your Card balance at participating stores, Starbucks.com/card or 1-800-782-7282. Cannot be redeemed for cash unless required by law. Refunds only provided for unused Cards with the original receipt. 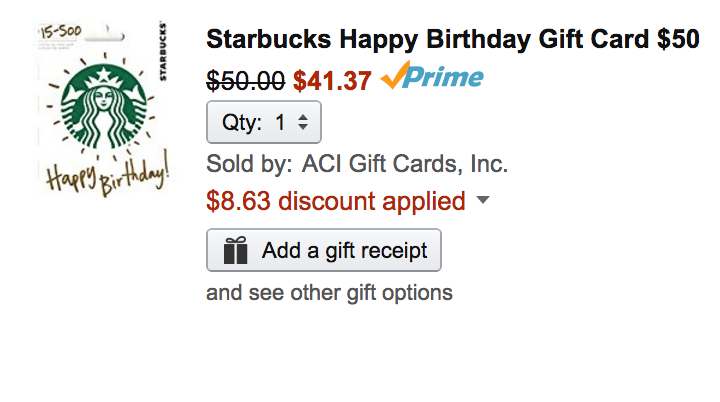 This Card does not expire, nor does Starbucks charge fees. Complete terms and conditions available on our website. Use of this Card constitutes acceptance of these terms and conditions. Since 1971, Starbucks Coffee Company has been committed to ethically sourcing and roasting the highest quality arabica coffee in the world. Today, with stores around the globe, the company is the premier roaster and retailer of specialty coffee in the world. To share in the experience, please visit us in our stores or online at www.starbucks.com. Starbucks Cards redeemable at most SB locations visit starbucks.com/card to register or reload.